A Twitter account in the hands of a hothead startup founder can be a dangerous thing. The New York Times ran a piece Sunday looking into why a 62-year-old pill saw its price skyrocket from $13.50 to nearly $750 after it was acquired by Turing Pharmaceuticals last month. The increase in the price of Daraprim, a drug that the Times reported “is the standard of care for treating a life-threatening parasitic infection,” will undoubtedly have a major impact on those struggling to keep up with high prescription drug costs. It was apparent that the news regarding Daraprim was set to stir up a storm for Turing Pharmaceuticals, which had already sent out a press release Thursday after a few other publications had dug into the price hike. 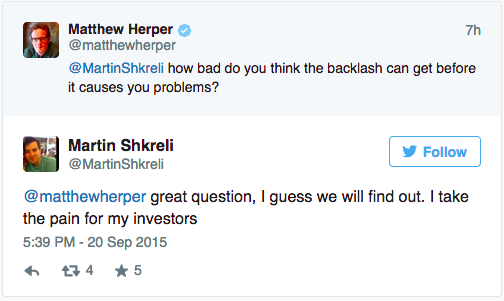 Martin Shkreli, Turing Pharmaceuticals’ founder and chief executive, took to Twitter following the article’s publication Sunday to do some of his own damage control. 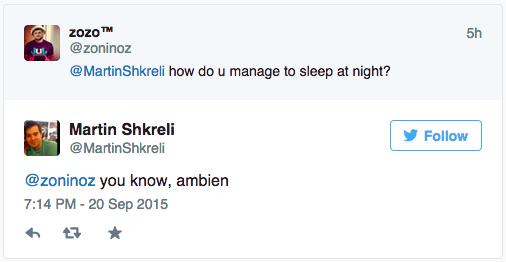 In the 15 or so hours following the Times article’s publication, Shkreli sent out 125+ tweets to the “haters” calling out his company’s operations. In a world where corporate public relations missteps are met with highly manicured executive responses, it’s clear that Shkreli is not satisfied with letting the press releases do the talking. The former hedge fund manager’s responses to other Twitter users regarding the controversy were more immature than one could plausibly expect from a successful CEO, and painted a picture of a leader who is, at best, incapable of speaking on behalf of his company effectively, and is, at worst, incapable of showing any sympathy to those struggling to afford his company’s life-saving drugs. It’s all painfully ironic for a guy who started a foundation earlier this year under his own name for helping out the underprivileged. The site starts reeking of hypocrisy when you weigh the foundation’s mission statement against the actual words Shkreli writes out on Twitter. Founded in early 2015, the Shkreli Foundation is a non-profit charitable organization dedicated to helping people facing a variety of adversities. 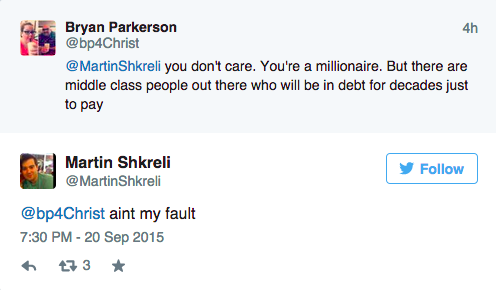 Shkreli seems to believe that the ire of those calling him out comes from a place of “socialist and liberal rage,” rather than genuine frustration. The founder has a lot of choice words for random Twitter followers but it sounds like he believes that when it comes to responding to media criticism, Eminem lyrics and a physical gesture sum up his emotions a little bit more succinctly.